The Innisfail Airport is 11KM west of Innisfail on HWY 54. If you are not on the schedule, JUST SHOW UP you may need to wait but we will get you a flight! Kids MUST HAVE A SIGNED PARENTAL CONSENT FORM (click to download) to go flying. We will also have forms available at the airport. This is a VOLUNTEER activity with the local pilots donating their time and aircraft to share their passion for aviation. 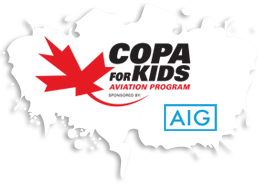 In conjunction with the Canadian Owners and Pilots Association, the pilots of COPA Flight #130 at the Innisfail Airport will be holding a COPA for Kids Rally on Saturday October 20, 2018. Although this event is primarily aimed at the Grade 6 students, any child aged 8-17 with parental consent may participate. Due to the possibility of bad weather, the rain date has been set to Sunday October 21, 2018. We will do our best to post a go/no-go decision by Friday evening but at the very least a final go/no-go decision will be made and posted here by Saturday at 7:30AM. Anybody aged 8-17 with a signed consent form can get a ride. Here is the COPA for Kids guideline for participants and parents. We will need a signed copy of pages 4&5. Kids MUST HAVE a signed parental consent form, here is the PDF we will also have forms available at the airport. Older kids (i.e. adults) may also get rides space permitting...the kids come first!